What can we learn today from a leper who kneels before Jesus in the hope of being healed? We know from our reading of St. Mark’s Gospel that as Jesus began His public ministry, He drew large crowds (see Mk 1:28, 33, 37). Today, we meet a leper who had apparently seen or heard enough about Jesus to make him take a bold action. Jewish law kept lepers away from the worshiping community, because the leprosy made them ritually unclean, unable to participate in the liturgical life of Israel. This can be difficult for us, in our day, to understand. In the Law of Moses, in order to teach the people about God’s holiness—a lesson they desperately needed in order to be His chosen people—they had to learn in simple, obvious ways that God is Life Itself, pure goodness, perfect justice. Nothing associated with death (the result of man’s disobedience) could enter His presence. That meant that blood, disease, or death (a corpse) made a man ritually unclean, keeping him away from worship. Ritual defilement always called for ritual purification. These exterior practices, given early in Israel’s history, were meant to teach the people the difference between holiness and impurity, between righteousness (life) and sin (death). Ritual impurity, like a contagious disease, could be spread by contact from one person to another. Thus, lepers were required to live apart from the liturgical communion of Jews, and they were never to have physical contact with anyone who was ritually clean. Knowing this, we can better appreciate the courage of this leper in our reading. What made him disregard the restrictions of Jewish law and drop down on his knees before Jesus? Was it the reputation Jesus had already earned as One who taught with authority, cast out demons, and cured the sick? The leper longed to be “clean.” He wanted not just to be healed of a dreadful disease but also to be able to enter again the worship of God’s people. He must have been convinced that Jesus could do this, and so he pressed forward. Look at his request: “If You wish, You can make me clean.” This one statement is a window into the leper’s heart. Even though his need was great, he makes a request, not a demand. He longed to be clean, but he acknowledges that the prerogative lay entirely with Jesus. It is an amazingly humble posture. His terrible misfortune had not made him angry or bitter; it had not filled him with so much self-pity that he expected Jesus to make him clean. Such is the heart of a true Israelite. See the impact of the leper and his words on Jesus. He was “moved with pity.” Here is where we begin to understand the deepest meaning of this encounter. The “unclean” leper stands for sinful man (us, in other words), whose disobedience (the disease of sin) prevents him from communion with the holy God. The Law given to Moses identified and contained the sickness but was not able to heal it. Jesus can. The sinner has no “right” to this healing; he is utterly cast upon the mercy and grace of God. On his knees, in a posture of adoration, the sinner, too, must say, “If You wish, You can make me clean.” What happens when we do this? Jesus “stretched out His hand, touched him, and said to him, ‘I do will it. Be made clean.’” Not only had the leper acted courageously in approaching Jesus, but our Lord did the unthinkable by stretching out His hand to touch the leper. Here was something new in Israel! The Law required holiness to be preserved by not coming into contact with impurity, because impurity was contagious. Now, however, the holiness of Jesus reaches out and itself becomes contagious. It conquers and heals the impurity. Why? Because God wills it. We can almost hear the delight in Jesus’ words when He makes this clear. This is exactly what He came to do. As Erasmo Leiva-Merikakis has written, “Christ’s fingers, which had so joyfully created man out of the clay of the earth, now exult as they receive admission into poor human flesh in need of regeneration” (Fire of Mercy, Heart of the Word, pg 324). 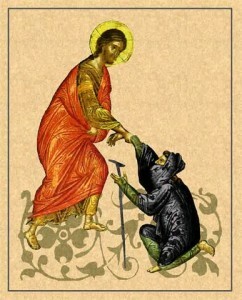 What can we learn from the leper today? Not a bad question to ask ourselves. Possible response: Lord Jesus, I learn from the leper that You are delighted, not disgusted, when I kneel before You to cure my sin. Here we see a portion of the Law concerning leprosy. In reading it, we should be able to understand that the disease represents sin (why would it be a priest, not a doctor, who examines the leper?). The Law separated a leper as “unclean” and required him to live “outside the camp.” This phrase appears again in the description of Israel’s Day of Atonement. After animals had been slain as an offering for sin outside the Tabernacle (the tent of worship before the Temple in Jerusalem was built), the carcasses were dragged “outside the camp” to be burned (see Lev 16:27; Heb 13:11). In this we see again the removal of impurity away from the presence of God. The writer of Hebrews reminds us that Jesus, Who from eternity willed us to “be clean,” was willing to become like a leper and suffer “outside the gate [the city] in order to sanctify [or make clean] the people through His own blood” (see Heb 13:12). We always need to make the connection between physical disease as a representation of sin in Scripture. Jesus healed physical infirmity as a sign that He came to heal us of sin, a disease that corrodes our souls the way leprosy corrodes skin. The visible act of physical healing represented the invisible act of a cure for sin. It is good to remember that the apostles, after the Ascension and Pentecost, did not set up public health programs. They preached repentance and faith in the One willing to make His abode “outside the camp” in order to make us clean. Possible response: Lord Jesus, thank You for coming “outside the camp” to find and rescue me. St. Paul’s letter to the Corinthians was filled with practical instruction about the many problems they experienced in their church. One of their biggest challenges was disunity. His advice was simple. It began with “do everything for the glory of God.” The alternative to that, of course, is to do everything for ourselves and our own purposes, and that leads to fractures in the Christian community. Then he says, “Be imitators of me, as I am of Christ.” St. Paul means that the Corinthians should follow his example of “not seeking my own benefit but that of the many.” He thought of this as a summary of what Jesus did for us, to heal “the lepers” of our disease of sin: Jesus gave life for mine; now, I give my life for yours. Are there “lepers” in our lives from whom we want to recoil and separate? Do we still think we can? Possible response: Lord Jesus, help me remember St. Paul’s example to seek the benefit of others, especially the difficult people in my life, instead of my own.